I mean…how chic is this kitchen? in this lovely powder room! That gorgeous Roost light fixture…I love it! 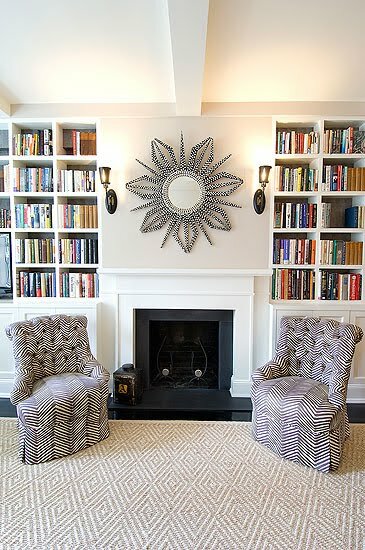 what would you call this style of decor? Kisses my lovey and thanks for all this beauty! 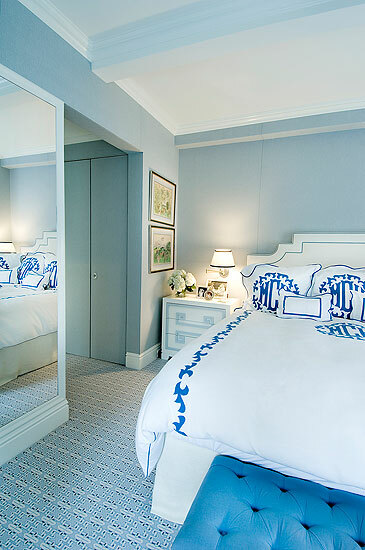 Such gorgeous rooms – definitely love the monogrammed linens & the orange ceiling! I really like that description. It fits perfectly! I love the chevron pattern on the bathroom floor. I love her style too – although I am probably more on the timeless side than the twist side. However, I really appreciate the twist! I'm a huge fan of built-in book cases. After cking out you condo I totally agree with you. This is your style, at least wehn you are taking risks. You place turned out awesome! This style… fresh with a punch! How nice to find someone who shares your taste, and describes it so succinctly! This is a lovely look. 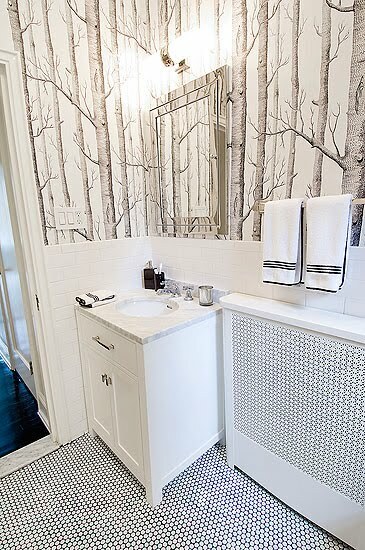 That birch wallpaper is fabulous! I love your style and "Timeless with a Twist" fits perfectly! That's exactly how I would describe it too!!! The wallpaper in the powder room is amazing! Really gorgeous decor style! Lovely- I have seen the lucite chairs and the forest wall paper-love them both. That zigzag mosaic tile is amazing- I have also been to the paint store twice to look at orange paint samples for a project I want to start- now I know what shade of orange I am looking for! Gotta have the monogrammed linens! 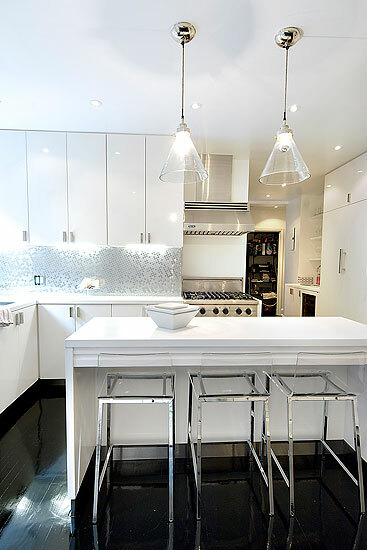 Where did you find lucite stools? MUST HAVE! Her work is beautiful. I just looked at her website. I could easily live in any of those rooms. Timeless design with a twist, pretty much nails it! i've researched that wallpaper before – LOVE it but $$$ :o( .. and omg i have the SAME light she has in her bathroom in mine! .. and her tile backsplash looks like my tile in my bath .. so needless to say LOVE IT ALL!!! .. nice find! I love "Timeless with a Twist"….I think you BOTH have fabulous taste! how cool that she answered you! Love her style too- bold but not over the top. I agree – she has a timeless taste with a little twist. That bathroom floor is so cool. Love her style. So beautiful! Love these! That orange ceiling, I am crazy about orange, it always reminds me of Hermes, too! I went back and looked at your ski condo, it is amazing! I remember seeing it before, but it really is awesome, and I LOVE that wallpaper, just love it. That's my favorite room, you are so talented Sue! Really nice. I like the twist!!! Timeless Designs with a Twist describes you to a T! Oh yes! Timeless designs with a twist describes this perfectly. I love her style also. Very detailed but not too busy. I like anything with a twist 🙂 Those orange ceilings are such an eye-catcher and most probably a conversation starter! Beautiful taste! I love the tree wallpaper, the chevron bathroom floor, the orange ceiling…. Oh my, love your styles! These rooms are all so so stunning! I LOOOVE the orange and love that library! Me too – totally my style! Love the bathrooms and that orange ceiling – I die! Oh my gosh, that blue-and-white bedroom and that absolutely GORGEOUS kitchen are literally to DIE for. You have fabulous style!! I love it! It's hard to define style taste… I feel like I can't just say I'm modern or traditional… there is so much more to it!!! These are lovely. Glad you found your design kindred spirit! I can see why you like it – it's a very clean and yet comfy style. Great post ! Yes, a beautiful house indeed, and I have to say right up my alley. 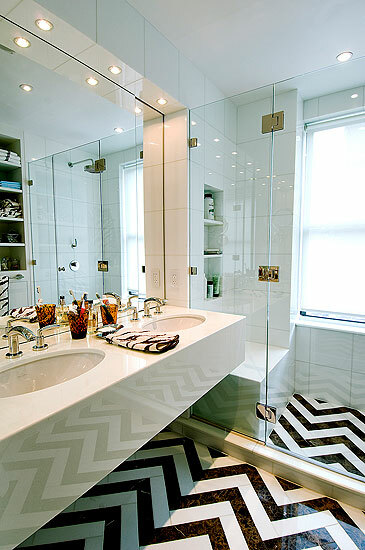 And the chevron tile floor in the bathroom is brilliant! Looks great and i LOVE that dark floor with the bright ceiling. who wouldn't? 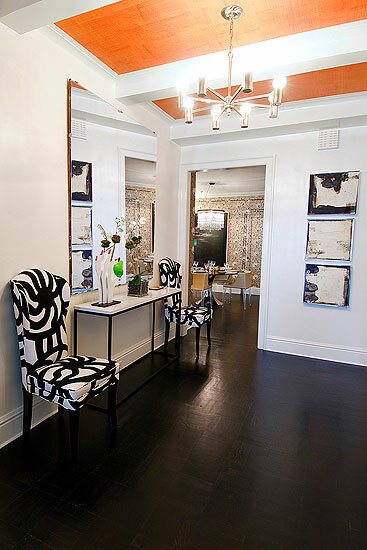 i really, really like the orange ceilings in the foyer and that chevron marble floor in the bathroom!! eek! I am with Ms. Alison here.. that chevron tile is killer! Love it! I think the photos are great inspiration and I love her description of her style. Very nice post. She is really great. Simple but really interesting at the same time. I like it! Oh that chevron bathroom floor….. I want that! I love that wall paper that you used in your ski home….. Seeing it in your home was the first time I had ever seen it! Thanks for sharing these gorgeous interiors. 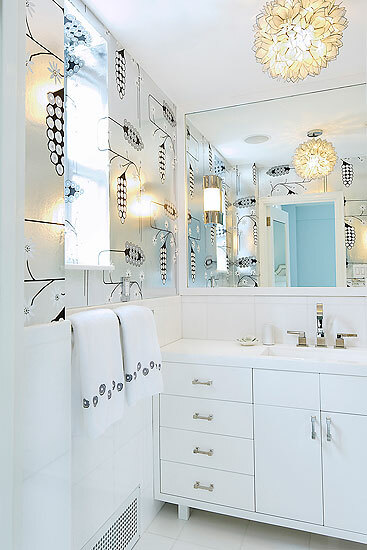 I love the first two bathrooms…and that blue bedroom…wow! I like it all, even though my style is a bit more traditional. My old boss used to say ‘good design is good design’. My favs are the orange ceiling and those chairs around that small table. I love the splash of orange with the black and white! So many great combos here! Wow, I don't know what I love the best! The wallpaper in the powder room, the chairs on either side of the fireplace, the monogrammed bed linens….it's all fabulous! WHoo… you struck a cord with this post! Great job. Timeless with a twist is just perfect and so FUN ! You know I love what you do. I NEED to have that Cole & Son's wallpaper! It is so gorgeous! um, I could move there tonight. LOVE it. I love her fearlessness with using the color orange…it's my favorite accent color! I also did a tiny bedroom in orange! Great images. Oh God, this is so good. I can't find a single thing I don't like! Suddenly my own home looks… very "greige". I was convinced it was your home! It is so YOU! (Seriously girl, you will have to show us more of your own lovely house). Both Ally and I want Hermes trays! Ally says they are impossible to find. Where did you find yours? She is really talented! I wasn't familiar but now I'm going to study up on all of her work. Thanks! you two have got some serious style… and you had me at orange ceilings. That's a great way to describe it! That's my style too! 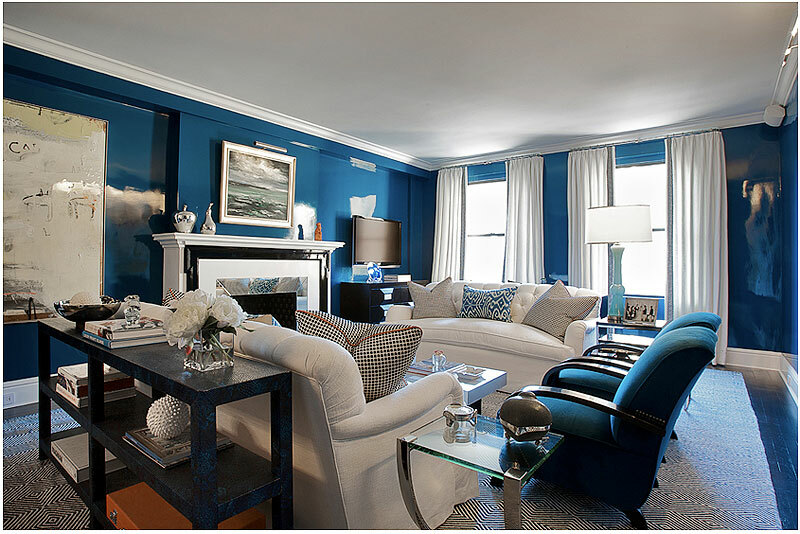 Style Stalking: Brett Design, Inc.